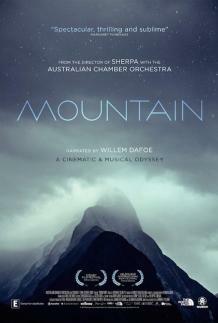 Those who think heights are better left to the birds might find themselves looking for an early exit in Mountain, a ravishing feat of vertiginous filmmaking set to a score of old (Vivaldi and Beethoven) and new (Arvo Pärt) classical compositions, performed by the Australian Chamber Orchestra. Examining our historical obsession with the titular peaks, director Jennifer Peedom’s Mountain is one of the most visceral essay films ever made, with Peedom and her cinematographer Renan Ozturk hopping across continents from Tibet to Australia to Alaska, unfurling a series of glistening images that should be seen only on the biggest of big screens. Mountain’s discursions offer moments of great beauty, whether venturing inside a Sherpa monastery or recording a mountain expanding and contracting, as though breathing, via the magic of time-lapse photography. Gliding shots of snow-capped mountains ringed by clouds and the daredevils who climb them are overlaid with excerpts from Robert Macfarlane’s Mountains Of The Mind, voiced with suitable cragginess by Willem Dafoe.